18.05.2010 MILD IMPROVEMENTS FOR ALFA ROMEO "MODEL YEAR 2011"
Alfa Romeo is launching the 159 "Model Year 2011" onto the Italian market, the stylish sedan and its estate "Sportwagon" version offering some new improved interior details as well as a wider depth to the range of comprehensive customisation packages to enrich the experience and make the Giorgetto Giugiaro and Alfa Romeo Centro Stile-designed D-segment car more competitive and keep it refreshed until the successor arrives in 2012. The Alfa Romeo 159 is approaching five years old and isn't in line for any mid- or late-life facelift, rather it has seen gradual improvements rolled out, including highly acclaimed new engines last year. However after being a regular feature amongst the top-three best sellers in D-segment in Italy since its arrival, worryingly for Alfa Romeo sales of both the sedan and Sportwagon have collapsed to just a trickle over recent months to the point it no longer makes the Italian top-ten. More so as the model now boasts well-received new engines and it has received little sales boost from this. 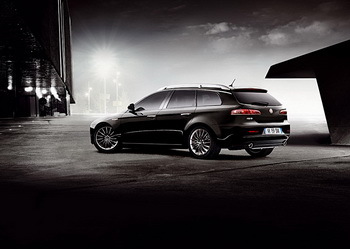 Thus Alfa Romeo will hope that improvements to the package in the MY2011 guise will help kick-start sales. 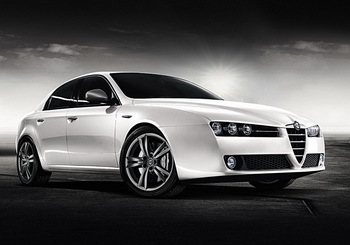 The Alfa Romeo 159 MY 2011 (sedan and Sportwagon) will be offered at a list price in Italy that makes it an attractive purchase and will be marketed from next month, starting from 24,360 euros for the Alfa 159 sedan 1.8 petrol (with 140 CV) and 27,000 euros for the turbodiesel 1.9 JTDM ECO (with 120 CV). The 159 MY2011 will offer more refined attention to detail and higher quality interior materials as a visual expression of "Made in Italy", and in particular to make the sleek car sportier and more original, so there is a new fabric used for upholstery, and especially for the "Distinctive" level where a rich combination of leather and fabric will be available in black and beige. Also, playing with shades of black, the cabin environment will be enriched with an elegant chrome-layer treatment and black brushed aluminum finishing on the dashboard, its trims, and the center console. Already introduced to the sister MiTo and Giulietta, with the Alfa 159 MY2011 the buyer can further customise their car with four specific packs: two that focus on enhancing driving comfort and two tailored towards greater sportiness. The packs "Comfort" and "Sport" are offered through the "Progression" specification level while the new addition of the "Comfort Plus" pack along with the "TI" pack are offered in conjunction with the "Distinctive" level. In particular the "Progression" specification level packs ("Comfort" and "Sport") can be purchased individually or can also be combined together. The first of these packs offers a multimedia player and voice operated phone controls in conjunction with Fiat's Blue&Me telematics system, radio controls mounted on the steering wheel, cruise control, electrically-stowing door mirrors, electrically-operated front seats and fog lamps. The "Sport" pack, adds to the equation a list of features that visually and cosmetically enhance the 159's sporting credentials, including 17 inch alloy wheels with a "brushed titanium" treatment, side skirts, an aluminum pedal set and sill, sports instruments with white back lighting, while the steering wheel and gear shift knob are both in a coated Leather. Exclusive to the "Distinctive" level are the two other packs (the new "Comfort Plus" and long-serving "TI"). The first provides a navigation system of maps covering all roads across European countries using digital SD cards, it is integrated with the radio tuner to optimise the reception of FM channels as well as including Blue&Me and a "Visibility" pack (comprising of new internal rearview mirror as well as rain, dusk and fog sensors) and electrically-folding door mirrors. Finally, the highest option available to create a sporty feel for the 159 MY2011 comes with Alfa Romeo's traditional "TI" package which is revitalised inside. In detail, the "TI" cabin environment sees a new leather seat format with black Alcantara along with the usual red stitching. 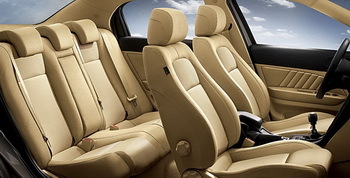 The Alcantara is located in the central section of the seats to provide more grip in demanding driving conditions. TI also offers aluminum 'sports' pedals and a kick plate embossed with TI logo, a sports steering wheel, fitted with radio controls, and perforated leather gear shift knob complete with matching red stitching. Blue&Me is also included in the package. Additionally, available on request are new carbon fibre inserts for the centre console and steering wheel to give the cabin an innovative hi-tech appearance. Finally, on the exterior of the TI pack there is a lowered sports suspension setup, new 18 inch alloy wheels with a "turbine" design (19 inch wheels of the same pattern are optional), red painted brake calipers and side skirts. Alfa Romeo 159 MY 2011 carries over all the engines now associated with the model, including the two new units added to the range last year, the 1750 petrol turbo (200 bhp) petrol and 2.0 JTDM (170 hp) with variable turbine geometry which are offered alongside the 1.8 petrol engine with 140 hp, the 1.9 JTDM turbodiesel ECO 120 bhp and the 200 bhp 2.4 JTDM (with automatic Q-Tronic transmission). The 170 hp turbo diesel engine can also adopt the "ECO" configuration thanks to its "green tyre" specifically developed for the model and a new set of gearbox ratios that work to lower fuel consumption and therefore the amount of CO2 emissions: 136 g/km (sedan) and 139 g/km (Sportwagon), and these values mean the 159 can collect tax benefits in key European markets where taxation is based on CO2 emissions, such as France, Belgium, Netherlands and the United Kingdom. In terms of safety the "Progressive" level Alfa 159 MY2011 offers as standard Dynamic Stability Control, VDC, which includes anti-slip ASR, assistance for hill starting, "Hill Holder", and 7 airbags (two front, two sidebags, two window bags and one to protect the driver's knee). The 159 will be graduallly refreshed until, as part of the Fiat Group's program of platform rationalisation, ‘Progetto 944’, the replacement arrives in 2012. This will dump the "Premium" platform, developed in a joint venture with GM, in favour of a lengthened, widened version of the Giulietta’s C-Evo platform (to be dubbed ‘D-Evo’). Sedan and estate body styles will be retained along with front-wheel drive and Q4. Engines are yet to be announced but expected to include the new direct-injection 1.8 TBi petrol as well as 2.0 MultiJet II diesel four-cylinders, plus the all-new Pentastar V6 and FPT 3.0 MultiJet II diesel V6. The Giulia, as it is likely to be called, will form an integral part of Alfa Romeo’s announced target of 500,000 sales a year by 2014, and in particular, the company’s currently on plans to re-establish a presence Stateside, after a 17-year absence.